Your weekly Netflix Pick isn’t really new but man does it deserve your attention. The STARZ original Ash vs Evil Dead is the perfect follow up to the cult classic series. Everyone loved these insane horror movies at some point or another. Ash Williams (who else but Bruce Campbell?) has spent the last few decades doing his thing. Avoiding responsibility, working retail, and hitting on female to cross his path. A night of intoxication leads to another reading from the Necronomicon. Ash finds himself once again thrust into the world of Evil Dead. A sequel thirty years after the fact is always a dicey measure. 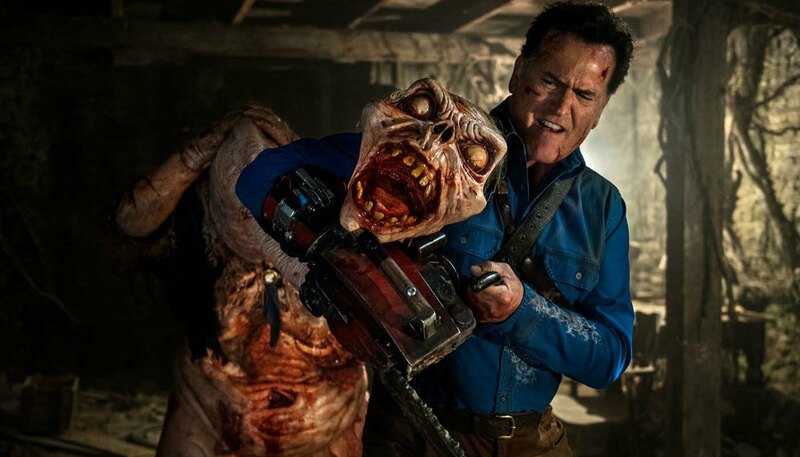 Acknowledging the B-movie roots and staying true to what fans loved is why Ash vs Evil Dead works. Sam Raimi himself is back as a creator for the short run series. Along with Sam are Ivan Raimi (Drag me to Hell) and Tom Spezialy (The Leftovers). The talent around the project is phenomenal. Every episode fits into the series. The thought of a show picking up thirty years on goes from being a quirky experiment to great television. Ash isn’t the same man from Evil Dead. Somewhere between Evil Dead 2 and Army of Darkness the celebrity facade of Bruce Campbell leaked its way into the character. Ash and Bruce feel like they’re one and the same, the heightened version being on screen. Of course this is an act, its the character, but it’s also what Bruce wants the character to be. Technology has changed a lot since Raimi first rolled actual film on his low budget thriller. 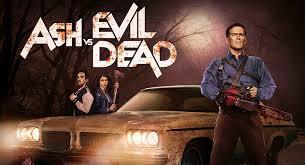 The advancements in entertainment along with a whole lot more money opens a lot of doors for Evil Dead. One of the best things about the old school movies is that the practical effects worked. Instead of pulling an all CG movie like certain trilogy prequels Ash vs Evil Dead stays true to its practical origins. The monsters are the perfect blend of silly and creepy. The gore effects are still excessive in the best possible way. Acknowledging the feel of the originals is why the series works. Paying tribute to the original story is exciting for long time fans. Old elements and story arcs come back to vivid life in HD (pun intended). Old faces reappear and new ones are inserted into the timeline nicely. As the series continues there is even some origin given which was way more exciting than originally anticipated. If you never saw the Evil Dead movies (what’s wrong with you?) don’t fret. Ash vs Evil Dead stand alone just as well as it mixes in. All the self-effacing ridiculousness holds up no matter what.